Charming Nafplion has a reputation as one of the prettiest towns in our mystery country, and that’s saying a lot. It’s located on the Peloponnese, a large peninsula to the southwest of the mainland. Nafplion is often a gateway stop for tours of the Peloponnese, which continue on to historical sites such as Mycenae, Epidaurus and Olympia. 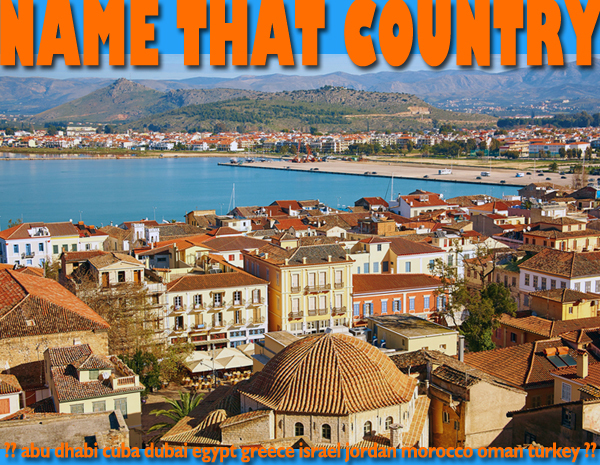 This entry was posted in Greece, name that country quiz and tagged Greece, greece tours, nafplion by yalla2013. Bookmark the permalink.